Washington University in St. Louis celebrated the 97th anniversary of Olin Business School with the dedication of two new buildings: Knight Hall and Bauer Hall. Creating a welcoming atmosphere and a lasting impression, a five-story glass atrium crowns the two buildings. Linetec finished Super Sky Products Enterprises, LLC’s skylight systems’ aluminum framing using a 70 percent polyvinylidene fluoride (PVDF) resin-based coating. The resulting combination achieves the project’s goals for transparency, durability and sustainability, including LEED® Gold certification. Olin Business School’s new buildings were designed by California-based Moore Ruble Yudell Architects & Planners as the architect-of-record and Mackey Mitchell Architects of St. Louis serving as the associate architect. General contractor, Tarlton Corporation, oversaw construction of the 177,000-square-foot, $90 million project. It is the largest single project completed on the Washington University Danforth campus in the shortest span of time, nearly doubling Olin Business School’s footprint on the campus. The aggressive construction schedule began in May 2012 and concluded in March 2014. The buildings’ dedication ceremony took place in May 2014. The inviting space unites the ensemble of buildings housing 11 classrooms, study rooms, a 300-seat auditorium, 75 faculty offices, lounges and other spaces to foster interaction. Super Sky met the project’s challenging goals, and its aesthetic and performance requirements by manufacturing and installing the skylight systems in three sections. The largest section is an 88-by-91-foot custom vault skylight. A single slope skylight caps another section measuring 5 feet by 46 feet 5 inches. 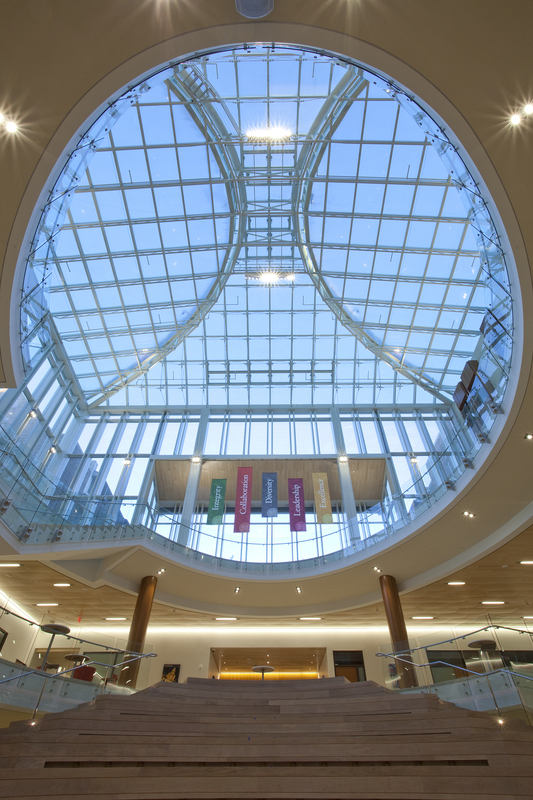 The final skylight is a 29-by-20-foot, custom curved, single slope system. Sent in 11 separate shipments over several months, Linetec finished Super Sky’s aluminum-framed, custom vault and curved skylights in Ivory, and the narrow, single slope in Bistro Bronze. These systems were painted using PPG’s Duranar®, a two-coat 70 percent PVDF resin-based coating. These high-performance architectural coatings meet the industry’s stringent requirements set by the American Architectural Manufacturers Association, AAMA 2605. This standard ensures the coatings exhibit outstanding resistance to humidity, color change, chalk, gloss loss and chemicals for long-lasting performance that requires minimal maintenance throughout the buildings’ lifespan. 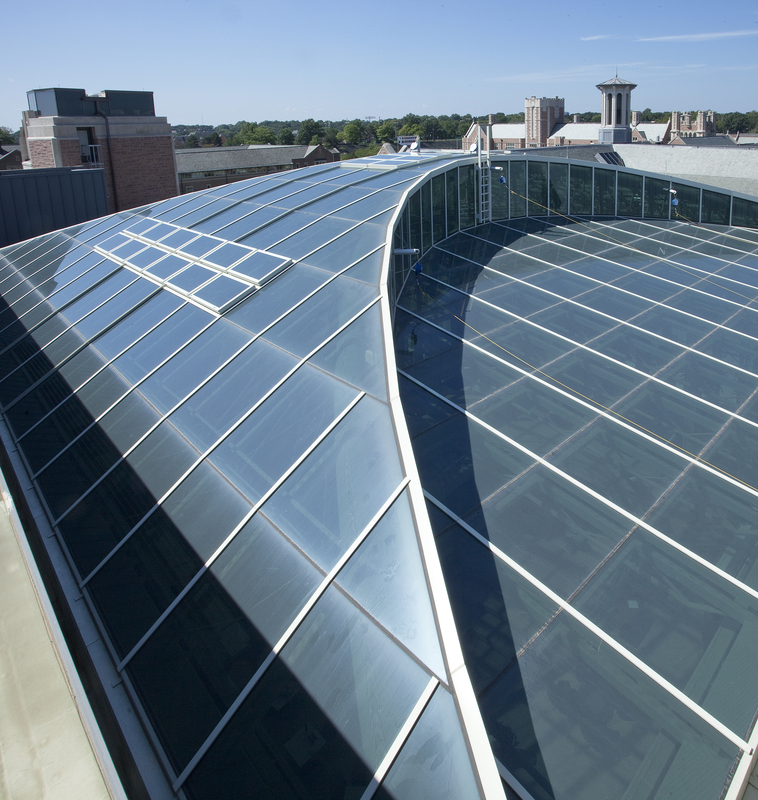 While the durable, painted aluminum skylight systems offer natural light and views with a connection to the natural world, the low-e insulated, laminated, silkscreened Viracon VUE1-50 glass keeps the occupants comfortable. In total, the skylights’ total glass area is 11,150 square feet, with each of the hundreds of glass lites averaging five feet in length. “This is a building that is all about natural light – we wanted light to penetrate all five floors,” added Kolker. Viracon’s high-performance glass also assists in lowering energy use by managing the unwanted solar heat gain and glare. Combined with daylight, views and durable finishes, these attributes can contribute to the project’s LEED for New Construction (LEED-NC) Gold certification through the U.S. Green Building Council. As an environmentally responsible finisher, Linetec captures the liquid paints’ volatile organic compounds (VOCs) content to eliminate the exhaust of potential pollutants. The primary environmental concern with liquid paints is the solvents, which may have VOC content and must be destroyed safely. Linetec uses a 100 percent air capture system and destroys the VOCs with a regenerative thermal oxidizer, so there is no adverse environmental impact. Linetec then re-uses its heat energy byproduct to improve process energy efficiency. This process of re-use is completed before the material exits the paint line. 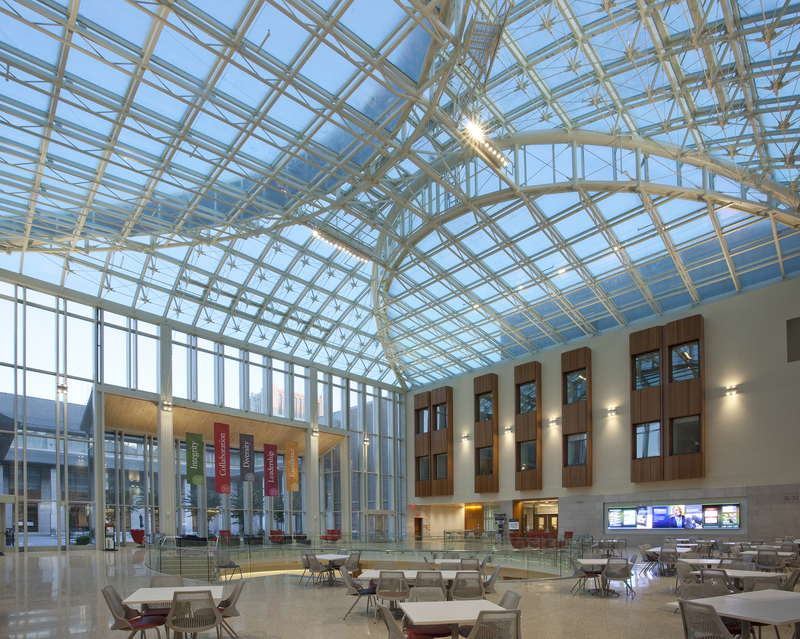 Recognizing the project’s green design and construction, LEED-NC Gold certification was awarded to Olin Business School’s Knight Hall and Bauer Hall in November 2014. In addition, Tarlton Corporation’s work on the project earned the Associated General Contractors of America’s 2015 Alliant Build America Award.